Thank you for this blog post! I definitely have to get out of my comfort zone a bit more. Staying in the safe zone and playing it safe hasn’t done much food lately! I LOVED this! I am constantly uncomfortable – mainly because of perfectionism. Perhaps also because I now live in a foreign country?! My big “uncomfortable” isn’t that though (I speak the language and have lived here before). It’s because I’ve started writing a book. Talk about discomfort and fear!! Thanks for the encouragement. I’m leaving my career of ten years to start something completely new to me— and in a new city! also at much less pay… because I think I will find a lot more happiness and peace than I have now. Shakin’ in my boots! You can do it! So many high fives! This is a great reminder! 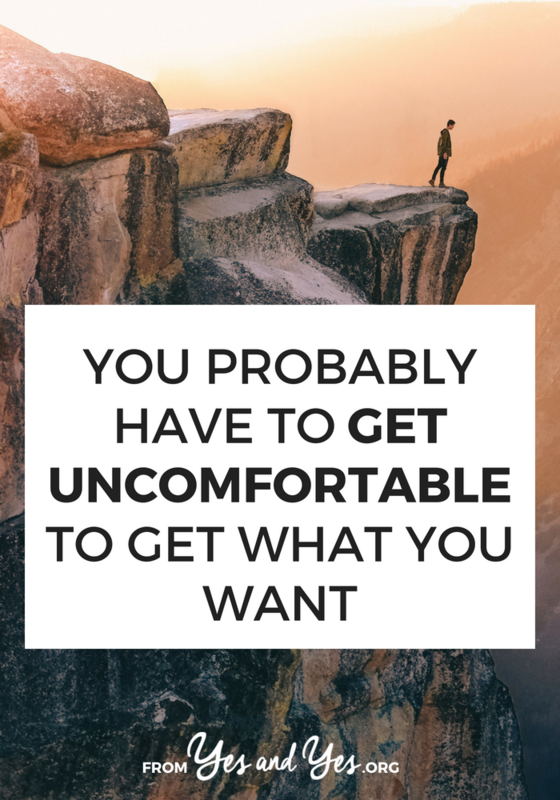 I look for those good-uncomfortable situations because I feel a lot of growth lies there. I also wimp out a lot and don’t follow through because sometimes growth is overrated. But seriously, I know society places a lot of importance on comfort, but I personally find comfort to be the antithesis of adventure. I prefer to choose adventure. This was a nice bit of encouragement to keep going through the uncomfortable process of confronting a couple of personal issues. I have an external issue with a family member that I’m trying to process and navigate, which led to a realization of some unintentionally disrespectful behavior on my part. It’s rough going right now, but I’m trusting that the end result is worth the pain. I wimp out a tonne on pushing myself but I also often manage it on a big scale! Moving to a foreign country where I don’t really speak more than a few words of the language and know no one? Sure! Vacation alone in scary sounding places? Sure! Make presentations in front of hundreds of people? Sounds like fun! And when I do push myself I try to remember what’s the worst that can happen? Usually it’s that I’m embarrassed. So what?! I’ve been embarrassed a bunch before, I’m still here! Someone wrote a book called Feel the Fear and Do It Anyway. This title stuck in my mind like a mantra tho I have to confess that I never read the book! I believe that I’ve lived my whole life this way if you don’t push for the boundaries how do you know what is possible to achieve. I’m now a 66 year old fashion blogger!